The Sacre-Coeur Basilica is a Roman Catholic Church in Paris, France. The official address 35 Rue du Chevalier de la Barre, 75018 Paris, France sits atop a hill high in Montmartre. This church opened in 1914 and the architectural style is Ancient Roman-Byzantine. Can you imagine what it might look like? The familiar landmark in Paris rests on the highest point in Montmartre with panoramic views of Paris below. History has it, Saint Denis, back in the 3rd century was beheaded here and this is only the beginning of blood that has been shed on this hill. Apparently, this basilica was built to appease Frances loss in the Franco-Prussian war. The architect & designer was Paul Abadie who won the contest. The triple arched front is ensconced by two massive bronze equestrian statues ridden by Frances saints, Joan of Arc & King Saint Louis IX, both designed by Hippolyte Lefebvre. The bell, or Savagarde, is one of the worlds heaviest bells. It weighs 19 tons. The stone used to build the basilica is Chateau-Landon or Seine-et-Marne stone. This is a frost free travertine which bleaches as it ages becoming more white. Bronze doors open which contain foliage designs. Joan of Arc is an enigma herself and history is probably not correct in the exactness of her dilemma and outcome. In memory for her and her name I give you the BLUE OCEAN which no one can deny. 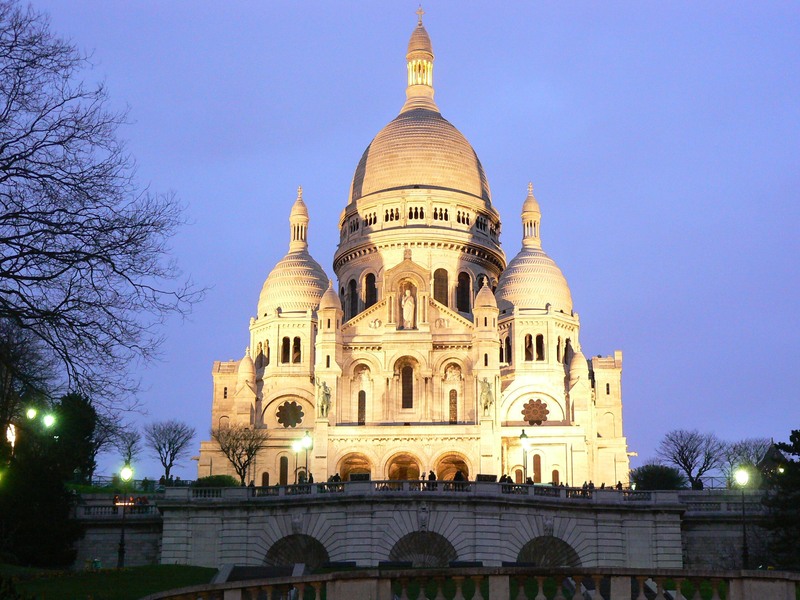 The Sacre-Coeur Basilica in Paris is open from 6 am until 11 pm. Once inside you can climb to the top and from the dome see all of Paris. This is 271 feet above Monmartre. A crypt has statues of the saintly kind and some believe the relic contained is the very sacred Heart of Christ. Am I to believe what I just typed? After all sacre-coeur literally means sacred heart. Gardens and a fountain are out back. This white castle commissioned by the French government in 1873 symbolized confidence for the people and was finally finished around WWI. In 1922 Luc-Olivier Merson created an inside master piece which sits above the choir. Christ in Majesty is a mosaic display of Christ with a golden heart and outstretched arms. Christ is accompanied by none other than his mother, the Virgin Mary and yes, Joan of Arc! A clear blue sky as a backdrop for the church is spectacular or come at dusk when a pink sky dances with the basilica lights. The views of Paris are extraordinaire and second in height only to the Eiffel Tower. 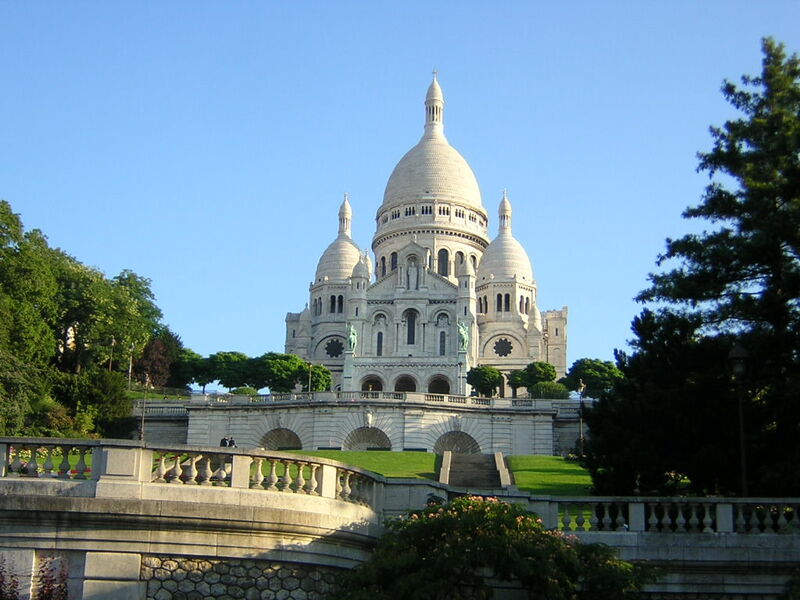 The Montmartre hill has been a sacred site for a long time. Druids (Celtic people of education & class from Ireland, Britain and Gaul) worshiped here and the Romans worshiped Mars and Mercury from temples they built. The first bishop, St. Denis, of Paris was memorialized with a Christian chapel around 475 AD. Monmartre became associated with Christian martyrs and this became a destination during the middle ages, thus pilgrimages for worship. An abbey surrounding the chapel was destroyed during the French revolution in 1792. The Abbess was executed. Furthering the bloody body count in 1871, Paris Commune Members hid in chalk mines. The government blasted the exits with dynamite, thus they were killed. 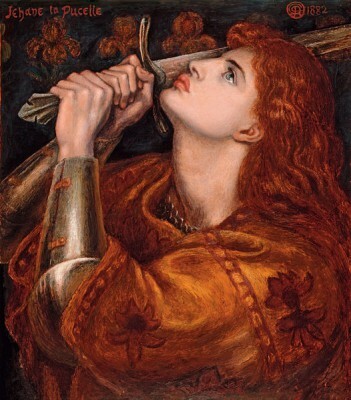 The painting below belongs to the Fitz William Museum and is Dante Gabriel Rossetti’s rendition of Joan of Arc. Why would ones own government dynamite an exit, except to destroy & kill? What was the commune? The Paris Commune occurred in 1871 from March 18th to May 28th. France had been victorious in the Franco-German war and Napoleon III’s Second Empire had collapsed. Republican Parisians feared a restoration of the monarchy. Quickly communes formed in France but were suppressed. Paris faced the government of Versailles alone. Twenty thousand were killed by government troops in “la semaine sanglante.” Thirty eight thousand were arrested and thousands more deported. History definitely supplants any singular meaning for this historical landmark in Paris. 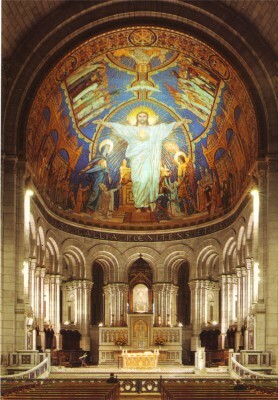 ***I have been asked to give credit (I gladly give) for the picture of the Sacre Coeur Basilica. Thank you for contacting me after three years. I always try to use my own or give credit. Since I have not visited Paris or France, then that is impossible!